The British wanted relief from summer heat and the Peak was the obvious place to escape it. When the Governor adopted Mountain Lodge as a summer getaway, development accelerated and the opening of the Peak Tram in 1888 made access easier. Gradually a community developed and a church, a club and a school were established. This full-colour book describes how the now-popular tourist area developed over time and adapted as needs changed. David Nunan has interviewed 74 Hong Kong residents of a wide variety of ages and nationalities. Every one of them has a story. To find out what he discovered, simply come to our book signing at Bookazine! Wine will be served. Please join us! 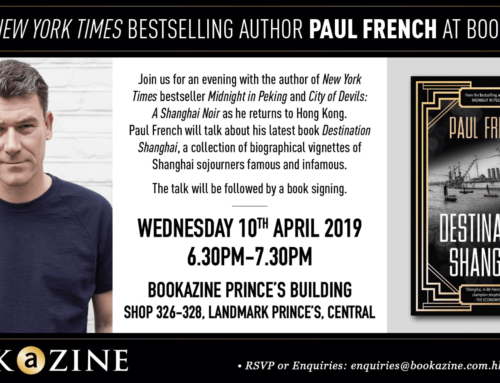 RSVP or enquiries: enquiries@bookazine.com.hk or tel: 25421133. Click on any of these links to listen to our authors talking about what they know best. Glenn Leibowitz is the host of Write With Impact. In his latest podcast he interviews former American diplomat Syd Goldsmith, author of Hong Kong on the Brink, a memoir of Hong Kong’s brush with the Cultural Revolution in 1967. If it’s not one royal society, it’s another. Have no fear, if you missed David Leffman’s talk about William Mesny (the “Mercenary Mandarin”) at the Royal Geographical Society in Hong Kong last year, you can listen in to the talk he gave to the Royal Asiatic Society in London in December. Charles Emmons’ book Chinese Ghosts Revisited came out just before Hallowe’en last year. New Dawn magazine’s reviewer has himself spent time researching the traditions of Hong Kong’s New Territories. Read the full review here. Charles also appeared on Jim Harold’s Ghost Insight podcast, and their conversation ranges from the Hungry Ghost Festival and collective apparitions to “haunted house” rental discounts and whether the phone surveys of ghost experiences that Charles conducted in Hong Kong in 1980 would be possible now. Click here to listen to the interview. The fatal Gresson Street gunfight happened in Wan Chai 100 years ago. Why has it been forgotten for so long? Patricia O’Sullivan has spent a decade digging out the full story for her book, Policing Hong Kong – An Irish History. Read more in Post Magazine. Patricia has also been telling the story of Hong Kong’s Irish policemen on Annemarie Evans’ Hong Kong Heritage radio programme – you can listen online. This newsletter is sent only a few times a year, whenever we have new books to show. If you like it, please help us out and share it with your book-loving friends. If not, please click the ‘unsubscribe’ link at the top and you’ll be taken off the list straight away. To be kept up to date with book news, giveaways, excerpts and events, please subscribe to our blog, follow me on Twitter or like our Facebook page. Thanks for reading!